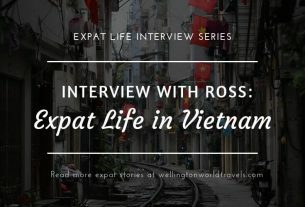 We are excited to welcome Charmaine Yip to our Expat Life Interview Series. She is from Canada, and has lived in Hong Kong since 2014. Let us get to know her more! A: My name is Charmaine and I was born and raised in Toronto, Canada. A: I currently live in Hong Kong and I moved here alone in 2014. A: I have been living in Hong Kong since 2014 and I plan to stay for another 2 years. A: I moved to Hong Kong originally to teach English, and then while working, I discovered an awesome opportunity to do a Masters degree part-time. It was perfect for me because I could keep working and have another degree in two quick years! Q: Moving from Canada to Hong Kong, what was your first impression? A: To be honest, it was super overwhelming! Rent prices are very high here and just finding a place to live under a tight budget was difficult. My workplace organized us a place to live for the first weeks while training so we can find a place, but it was exhausting. We finish training around 4pm every day and then go house hunting for the next few hours. Q: What do you enjoy most about Hong Kong? What were some of your favorite experiences in Hong Kong? A: Hong Kong is so convenient! The transportation system is so efficient and you can get anywhere on public transportation. You do not need a car! One of my favorite experiences was working in the college. The students were very kind, and relatable and some of them are still my friends today, even though I don’t work there anymore. A: There are so many things I miss about Toronto and I never realized how good I had it until I moved out. Toronto is known to be one of the most multicultural cities in the world, and Canadians are known to be the friendliest people on earth! I really notice this when I live abroad. I miss people being polite, the casual “thank you” and “sorry” and even people holding doors! And living in Hong Kong even made me appreciate the quality of life I had – the fresh air, the blue skies and the lack of crowds everywhere! Q: What has been the greatest aspect to your expat experience so far? 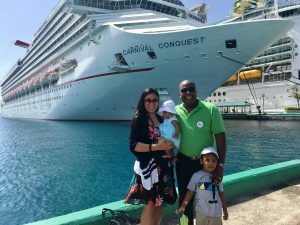 What are the adjustments you had to make when settling into expat life there? A: I’m not really sure how I would rate the quality of life. I mean, I think as someone who has money and able to afford the luxurious life here, I do think you can have an incredible lifestyle. Hong Kong has so much to offer – food diversity, nightlife, mountains and hundreds of hiking paths and good transportation. At the same time, Hong Kong is one of the most expensive cities in the world! Rent is incredibly high due to the lack of land, and you pay a lot for a small space. In contrast, you pay very little for utilities (electricity, hydro, phone and internet bills). There is barely any work-life balance, and many of the locals work overtime until late hours of the night. The summer heat is unbearable, and there are days where there is high pollution and you can’t see the skies. There is no free healthcare (like I do in Canada) but many large companies will cover it for their employees and their families. So it’s a give-and-take. Overall, it’s an expensive city but in other ways, it balances out. Some things are high (ex. rent, food), and others are lower (ex. utilities and transportation) than Canada. Q: What are the best things to do or places to visit in Hong Kong? A: Hong Kong is both an urban jungle as much as it is an island. I would say for anyone’s visiting, try to balance your activities. Spend a day in tourist districts (Tsim Sha Tsui, Causeway Bay) and marvel at the waterfront, and enjoy the skyscrapers. Then spend another day on one of the islands and enjoy the beach and hike. 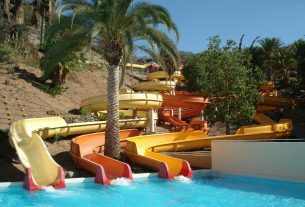 Then another 2-3 days going to the tourist attractions – Ocean Park, Disneyland, and the Peak. Q: Tell us about your typical day as an expat in Hong Kong. 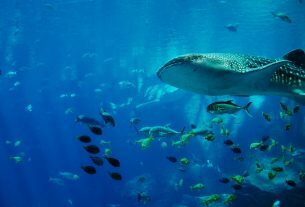 A: I make friends with both expats and locals. There was a year where I worked and recruited expats, but my admin colleagues were locals, so I had the best of both worlds. I think I fit in culturally a bit on both sides but not completely on either end. A: I didn’t have any difficulties with my visa. I think in Hong Kong, generally, it is quite easy especially if you work for a foreign company or in certain industries (i.e. banking or teaching). I was teaching and my workplace did it for me. A: The working culture here is much more intense. It is truly a workaholic culture. At home, most jobs would say 9-5 but here it is generally 9-6pm and most people do overtime (OT) and don’t get paid for it. It is expected that you finish the job, even if it is past your working hours. Q: What are your tips or advice for anyone looking to live and work in Hong Kong? A: Don’t stay in an ‘expat bubble,’ and try to expose yourself to more of the local culture and people. You will learn so much more. 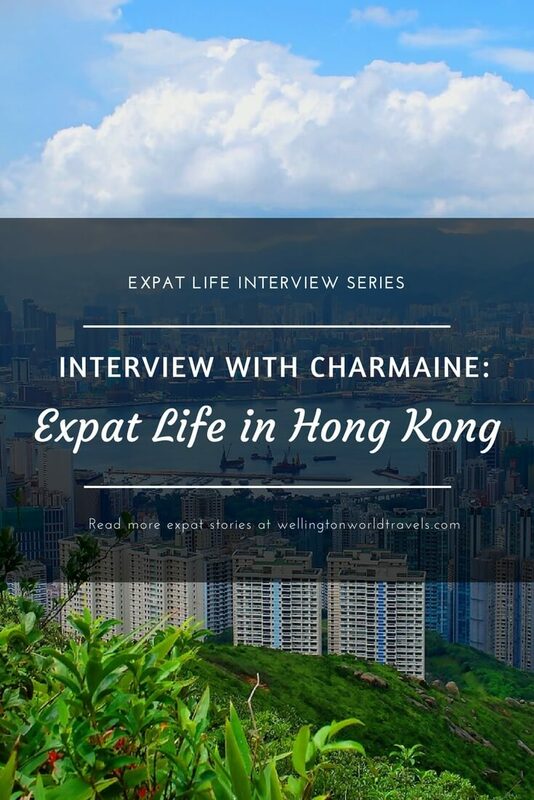 Thank you, Charmaine, for taking the time to be part of our Expat Life Interview Series! 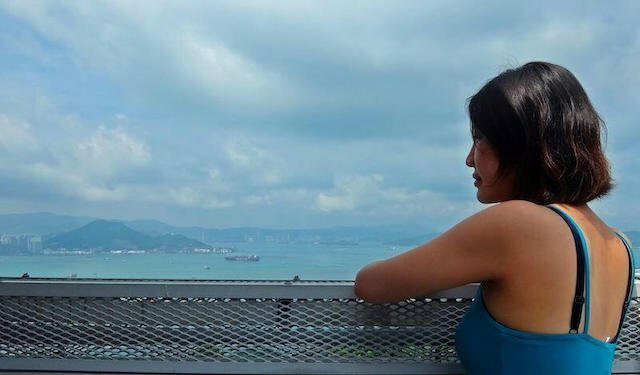 Charmaine Yip is the founder of The Canadian Wanderer, a website that teaches young adults how to live abroad. She has lived in Hong Kong since 2014 and works in the education sector. Prior to that, she has lived in Canada, Singapore, and France. Check out her travel blog http://thecanadianwanderer.com, or connect with her on Twitter, Pinterest, and Instagram. I really enjoyed reading Charmaine’s story. i have a friend who moved to Hong Kong for a stint of a few years. I miss her laughter, but I knew it would be a great experience for her. Now, reading what Charmaine has to say, I feel like I need to know more about her experience too! It looks like a beautiful city in some ways, but life does sound a bit harsh. It’s good to appreciate all that home has to offer when we’re away, and yet immerse ourselves in the culture as Charmaine does, too. Thank you for reading Charmaine’s expat experience and sharing your thoughts.